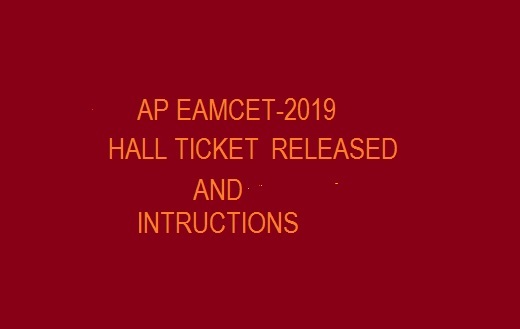 AP EAMCET 2019 Hall Ticket has been made available on April 16, 2019 on 12:45 PM. The exam is scheduled to be held on April 20 – 24, 2019. The candidates who have successfully filled and submitted the AP EAMCET 2019 Application form can download the Hall ticket now. The AP EAMCET 2019 Admit Card is made available in online mode only. You must download it from the official website www.sche.ap.gov.in from the candidate portal. To know more details regarding AP EAMCET 2019 Admit card scroll down this page www.teachernews.in. The AP EAMCET 2019 Hall Ticket / Admit Card contains all the important information regarding the test venue address and personal details of the candidate. It will be your identity throughout the admission process of AP EAMCET 2019. Candidates need to mark the below-mentioned dates regarding AP EAMCET 2019 Hall Ticket. Admit Card: Click the link given to download AP EAMCET 2019 Hall Ticket. 1.On the open window you will have to enter your Date of Birth and Registration Number and Qualifying examination hall ticket no. 2.Submit the details and your AP EAMCET 2019 Hall Ticket Check the details on the admit card properly. 3.Download and take a print out od the same. AP EAMCET HALL TICKET 2019, Download AP EAMCET Admit Card April 2019.